Would not wonder if this goes right into tempomage. 3/2 stats are great, aditional card draw in tempo mage to get to my fireballs? yes pls!!! Way too situational, need a lot of Spell Damage minions. Simple Bloodmage Thalnos or Loot Hoarder should be simply better. Playable with new mage 0/6 spell damage card. It has better stats than the bloodmage or loot hoarder though. I would not count this card out especially if a deck comes out that relies on spell damage. Although Coldwraith did not see play and that card also has great stats for its cost so it may unfortunately not see play. But this is a neutral so it has more of a chance since it is not just limited to mage. There was just never any room in a deck for Coldwraith. It was too combo dependent for an early game card. It wasn't a bad card or anything. This is cheaper and is less situational. 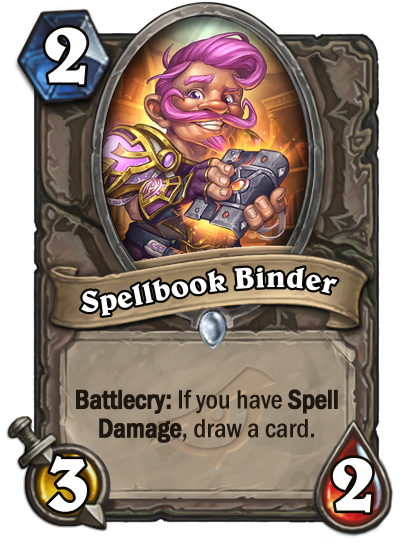 But any deck that runs spell damage wants to run spells, so there probably still isn't room for it. Thats because tempo mage had no natural way to activate the card draw from Coldwraith. While this card gets a lot of support. stat line is good enough, if you can get a cantrip off it thats good. The problem with this is how consistent can spell power be in arena, if this isnt good enough for constructed. The stat line rarely matters for decks in constructed that run these types of cards. This will be run in every deck that runs spell power. Reliable card draw that can be played naked turn 2 vs. aggro. Situational card draw but it's stick is pretty nice. It will definitely be used where appropriate. I don't know if it's been mentioned but how good would this be in Even Shaman in Wild? Turn 1 highroll a Spell Damage totem, turn 2 drop a 3/2 and draw a card? Maybe that's far worse than turn 2 drop a 3/4 and overload.